With the help of some top Instagrammers who either live in Jersey or have holidayed on the paradise island, we’ve highlighted some great places to take a photo that you can share with your family and friends. Why should Instagrammers visit Jersey? No matter what season you visit Jersey there are lots of picturesque destinations you can visit; from world-class beaches to living history locations and this is all within Jersey’s 45 square mile radius. In winter you can experience the elements by watching a storm or walking on a deserted beach, while in contrast during the summer months the island transforms and you’ll be able to soak up the summer sun. Spring in Jersey is also spectacular as one minute you can see dolphins playing in the sea and the next you can taste the first Jersey Royals. While we are on the theme of food, during the autumn months you can try Jersey tomatoes, pumpkins and apples as well as see the wonderful autumnal colours during a coastal walk. Absolute Adventures, who have been on Instagram for four years now, took this great snap of one of their groups kayaking by Jersey’s coast and say taking photos of the water is a great image to capture. Bam Perspectives see things from a different perspective as shown on their Instagram account, which has been active since June 2015. 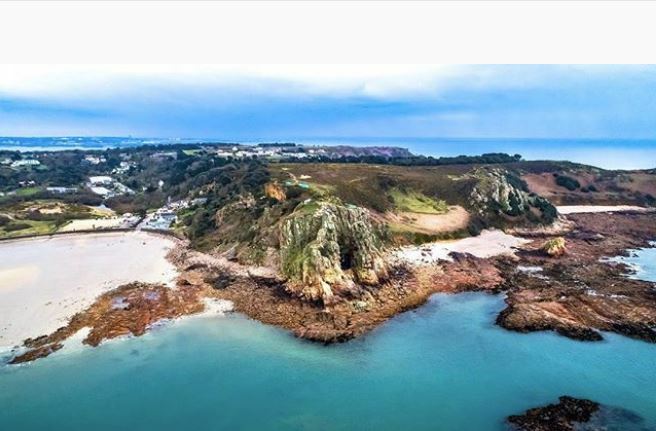 The aerial and videography firm share a range of aerial images of Jersey using drones to capture everything from a different angle. Georgie Ng Photography has been on Instagram since 2015 and has been sharing an array of photographs of Jersey since. This particular post is of La Rocco Tower at St Ouen’s Bay in Jersey. Jersey might be small, but it still plays host to lots of great sporting events such as the Jersey Triathlon (pictured above), cycling, athletics and much more. Ryan O’shea, who runs his own photography business, has been on Instagram since 13 June 2017 and he loves sharing all types of photographs related to Jersey. Ryan O’shea says, “I love that Jersey has some of the best sunsets in the world which are enhanced by our natural coastal landscapes for wonderful images to be taken all year round. “Jersey has a thriving sporting community which enables breath-taking images which shows pure passion and determination in island sport. Debbie Podger first joined Instagram in February 2015 and ever since has been sharing her stunning photos on Instagram from her travels around the world, but there is no place like Jersey as she believes there are so many photogenic locations across the island like this one of the Jersey coastline. Debbie, says, “The thing that most appeals to me about Jersey is the diverse weather which we experience all year round, making the Island a great destination whatever the season. We have a fantastic tidal range which gives us a wonderful choice in high and low tide shots, and you can never tire of searching for different locations and viewpoints. Jersey Adventures, the islands longest serving adventure activities provider, offers lots of exhilarating activities to you and a popular pastime is coasteering. Jersey Adventures has been sharing snaps of their tours over the past 3-4 years, like this one of a member of the group making a daunting jump from a cliff into the sea. Phil Coleborn has been using Instagram for the past two years and has been sharing unique photos like this one of Gorey Castle during the summer. Phil says, “It’s safe, friendly, and very diverse in many ways. Culturally historically and the landscape for such a small area. Jersey Heritage has been on Instagram for nearly five years and one of the reasons they love the social media platform is to not only share their own photographs but to see photographs from others enjoying their hometowns. Pure Jersey only started posting on Instagram in 2017, but now the outdoor and indoor leisure company shares snaps from their trips. In this particular post, you can see a photo from one of their coasteering trips in the summer. The Valley Adventure centre has had an Instagram page since 2015 and being set in the secluded and stunning natural valley in Jersey they love the great outdoors. There are so many great activities you can enjoy in Jersey; from walking to zip lining, and we’d recommend you get involved during your holiday. Jersey Seafaris have been on Instagram for six years after creating an account back in 2012 and now the RIB boat trip tour operator shares photos from its excursions. Jersey is famed for its incredible sunrises and sunsets and this great photograph of La Corbière comes from Jason Masterman, who has been sharing photos of the island since September 2014. Matt Noel is the owner of another Instagram account you should follow for great photographs of Jersey says the reason he joined the social media site is to connect with other photographers. Matt says, “As for what I love about Jersey for me it is all of the amazing things you can do out in nature whether it is going on photo walks and always finding little golden nuggets of photography around every corner or the amazing landscapes and beaches that we are lucky enough to have. As we touched on at the start of this guide the different seasons in Jersey mean there is always something different to capture. Michelle, also known on Instagram as the Channel Island Mama for the past 6 years, loves the dramatic passing of the seasons as demonstrated by this great snap of some primroses flowering on the island. Michelle says, “I love how dramatic the passing of the seasons are. We moved here exactly a year ago from Australia so we’ve come full circle with the seasons. It’s so lovely to be surrounded by spring at the moment – everywhere you look there’s daffodils, primroses and trees coming into blossom. There’s something very magical about Jersey – winding lanes, woodlands, hidden beaches and caves, secret forts and beautiful castles everywhere. “You really do feel like you’re a million miles away from big city life. I love how immersed you can be in nature, it’s a wonderful place to bring up kids. There’s plenty of indoor attractions but when the weather is dry I love bringing my little boys out into the countryside for an explore or to one of the many beaches for a runaround and a play. Even though we’re out and about all the time, there’s still so much of the island left to see – it’s hard to believe it’s only 9 by 5 miles! This entry was posted in Places to Visit and tagged instagram, Jersey. Bookmark the permalink.